Researchers have demonstrated a new technique that can store more optical data in a smaller space than was previously possible on-chip. This technique improves upon the phase-change optical memory cell, which uses light to write and read data, and could offer a faster, more power-efficient form of memory for computers. Rather than using electrical signals to store data in one of two states—a zero or one—like today's computers, the optical memory cell uses light to store information. The researchers demonstrated optical memory with more than 32 states, or levels, the equivalent of 5 bits. This is an important step toward an all-optical computer, a long-term goal of many research groups in this field. "Optical fibers bring light-encoded data to our homes and offices, but that information is transformed to electronic signals once inside computers," said research team leader Harish Bhaskaran from Oxford. "By bringing the speed of light-based data transmission to the circuit boards that run computers, our all-optical memory could enable a hybrid computer chip that interacts with data both optically and electrically." "Although our team has previously used this approach to optical memory, we've now been able to push the resolution limits of this memory cell by storing a larger number of intermediate states between zero and one," said Nathan Youngblood, a member of the research team. "This allowed us to store information in 34 levels, while only 10 could be achieved previously." The researchers accomplished the increased resolution by using a new technique they developed that uses laser light with a single, double-stepped pulse—two pulses put together into a rectangular-shaped pulse—to precisely control the melting and the crystallization of the material. "Instead of heating the material with a single laser pulse, we shape the pulse in a way that allows us to control the material's temperature over time," said Xuan Li, the paper's first author. "This provides the ability to adjust how that material interacts with light and the state it will reach after heating. It also greatly speeds up the writing process because we can change the material's state with just one laser pulse instead of the hundreds or thousands of pulses required previously." In the paper, the researchers showed that they could use their approach to reliably encode data on 34 levels, which is more than the 32 levels necessary to achieve 5-bit programming. 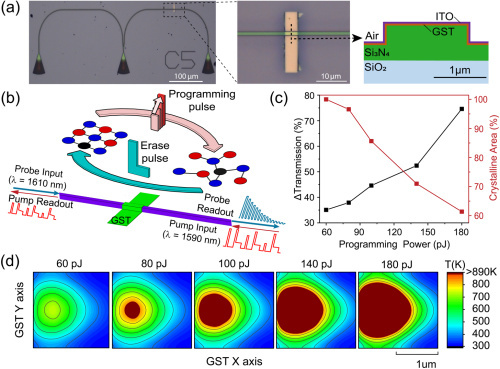 "This accomplishment required understanding the interaction between the light and the material perfectly and then sending exactly the right sort of laser pulse necessary to achieve each level," said Bhaskaran. "We solved an extraordinarily difficult problem." The new technique could help overcome one of the bottlenecks limiting the speed of today's computers: the link between the processor and the memory. "A lot of work has gone into improving the communication between these two units using fiber optics," said Bhaskaran. "However, linking these two units optically still requires expensive electro-optical conversions at both ends. Our memory cell could be used in a hybrid optical-electrical setup to eliminate the need for that conversion on the memory side by allowing data to be stored and retrieved optically." Next the researchers want to integrate multiple memory cells and individually program them, which would be required to make a working memory chip for a computer. The research groups have been working closely with Oxford University Innovation, the University's Innovation arm, to develop commercial opportunities arising from their research on photonic memory cells. The researchers say that they can already replicate the devices extremely well but will need to develop light signal processing techniques to integrate multiple optical memory cells.